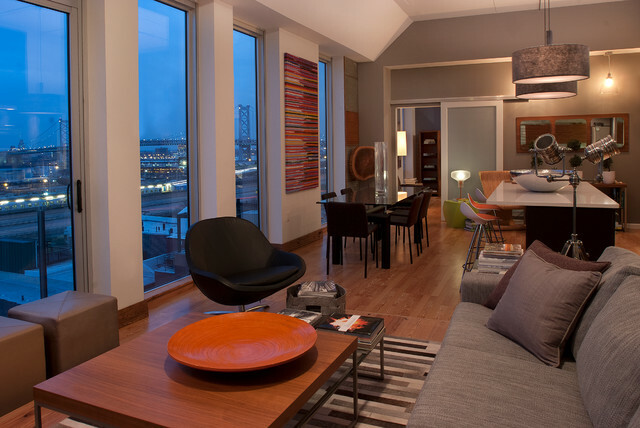 Philadelphia Penthouse Apartment - Contemporary - Bedroom - Philadelphia - by Groundswell Design Group Inc.
Where did you get the wood for the headboard? - Where did you get the wood for the headboard? and did you sand it down? 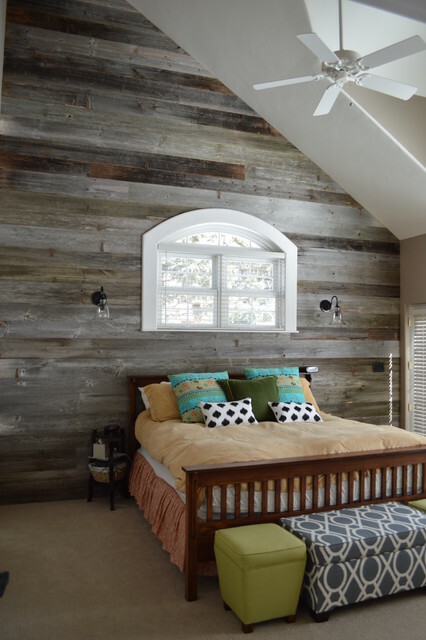 What type of stain/colors were used on the barnwood on the wall? Did you find it was difficult to work the used wood, warping issues? 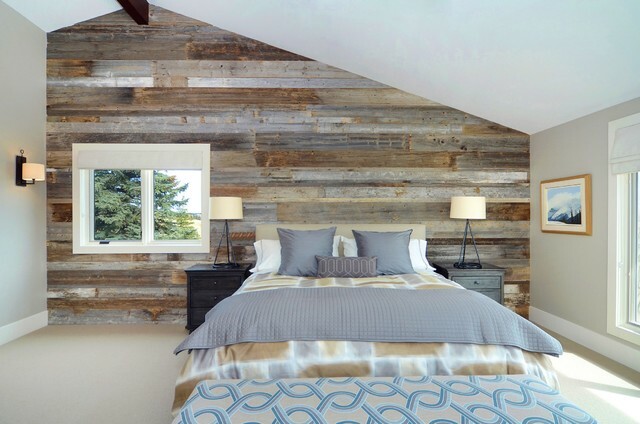 What source/vendor supplied the reclaimed wood? - Where is that nightstand from? Is it just me or 700$ for an MDF nightstand is beyond ridiculous? Love this design, but the price kills it. I'm looking for alternatives. Where is the night stand from? what kind of wood did you use for the bed ? 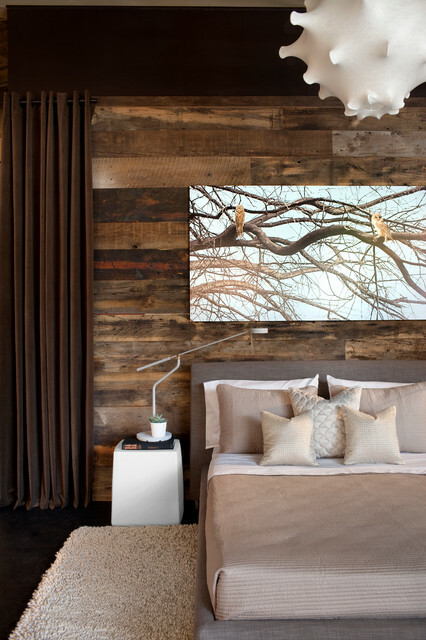 Is there anyway I could see additional pictures of the reclaimed wood wall? 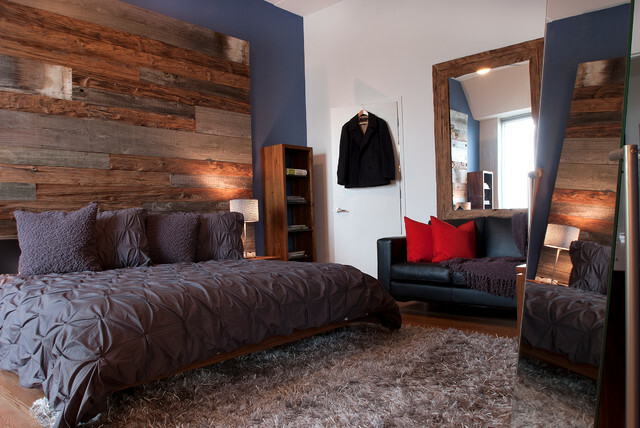 I'm looking to build one now with reclaimed wood from a great place in Cambridge, MA, and have never tried this before. 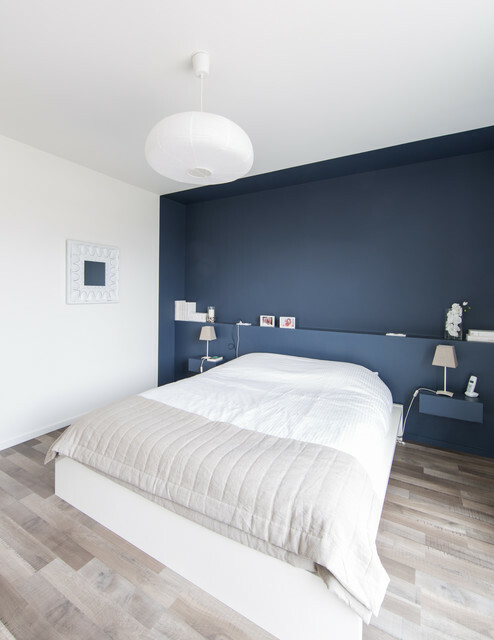 hey how re u .. nice bedroom.. this wall colour RAL CODE ? Painting the feature wall in my dining room this color... can't wait. 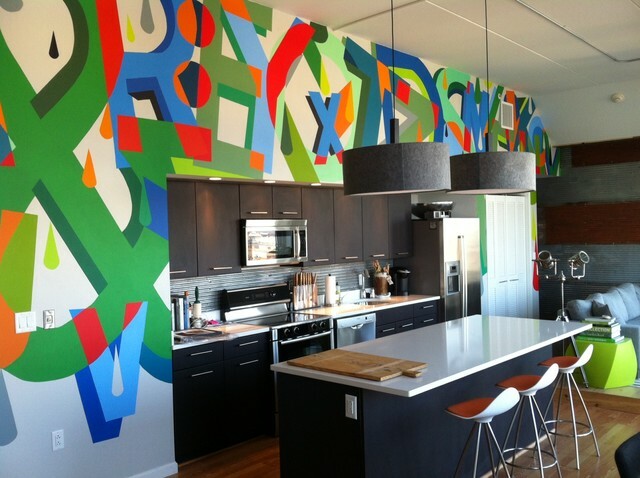 - What is the brand and color of the accent wall? Its dark colors are good for sleep for a long time...I LOVE IT.!!!!!!!!!!!! - What's the name of the blue paint color? so EXCITED! this color is perfect for my baby boy's room and you gave me the exact color. Awesome! 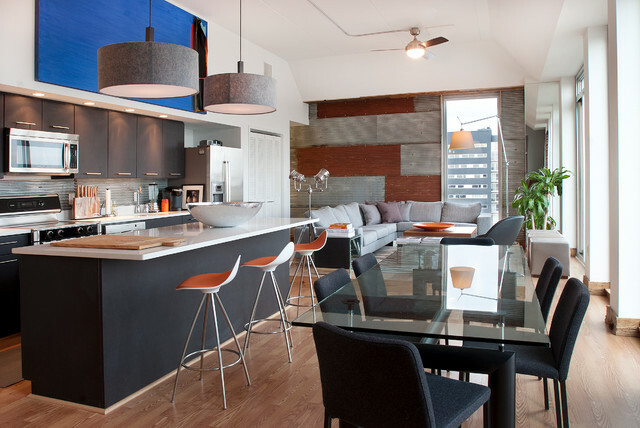 - How would one build a similar wall on a budget and/or removable, as it would be in a rental property? I wanted to say I love this look. Very cozy feel, great vibe. Great work. I could go on easily.... Lol. How can I order the wood from this picture? I absolutely love it! I want this duvet from west elm. Is the color slate? In some of the photos it looks brown and others gray? Bought my purple one with tags still on it at Goodwill. Queen size and purple. Love it. - could someone inform me of the color of the walls? I was scrolling through this awesome room and noticed your questions so I figured I would chime in... He answered that question several times actually :-) It's a custom color he had mixed to match a color in a painting hanging on the wall on the left. Scroll down a bit and you'll see he was awesome and attached a pic of paint lid with the exact formula for the color. Hope that helps. Gorgeous Room! Duvet and sham ? - I love the duvet and shams! I found the duvet on West Elm.com. What color did you use? I noticed two of the shams are a different style. What size shams and style did you use? what kind of wood did u use on the wall? Thanks for the question. 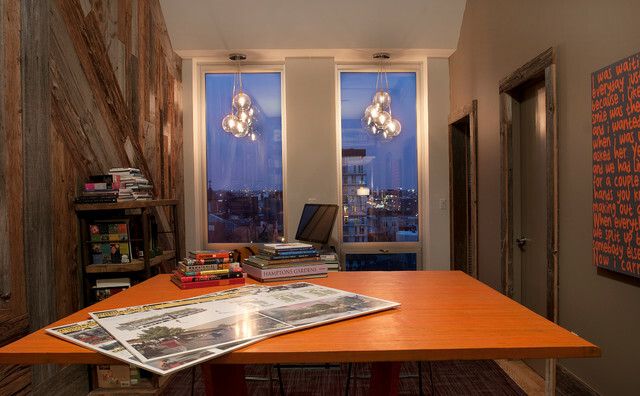 We used three different types of reclaimed barnwood. I heard that laminate make noises. Is it true? I would love to have laminate floor . Whats the name of the color? Is it Sedona Oak, Grand Oak, or none of the above? - Obviously the wall is wonderful, but I love the bedspread too! Can you tell me who makes it? Thank you! I looked on the website and found it. Now what color to choose! I love the color you used but not sure if it will make bedroom too dark with dark brown wood furniture. Maybe the light gray or soot duvet instead. The white looks too much like my own comforter. 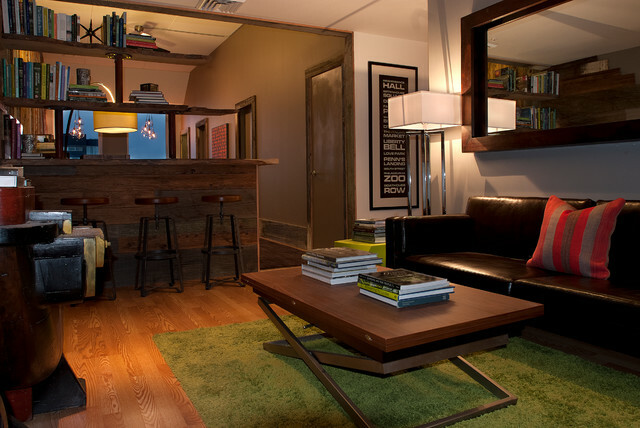 First of all, Groundswell, you're awesome for answering everyone's questions about your fantastic room. I haven't seen an answer for how you attached the wood to the wall. Forgive me if I missed it. Can you explain a little more about how you built and attached it? I'm thrilled to find this example! I've had an idea like this in my head for a while. Very nice. Simple and elegant. Congrats! - Blue with wood is always a risk and it came out really good. Thank you! We really appreciate the compliment! Groundswell - thank you so much for taking the time to answer questions and comments. It's VERY appreciated!! - Hi, this is nice. What did you use to make the brown wall? Thanks, Joe! 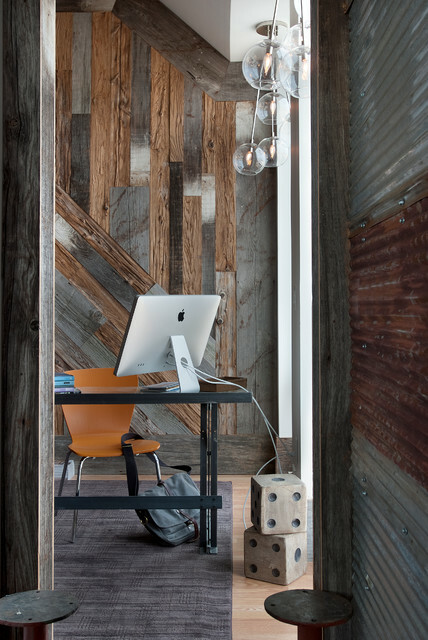 The brown wall is made of three different types of reclaimed barn wood. How did you attach the wood to the wall? this is so gorgeous and unique. I love it!! you have used the browns and blues in a totally new way. Amazing and unique headboard. Very earthy. - Where is the duvet/bedspread from? Thanks! Thanks for your comment. The bedspread is made by West Elm. Gorgeous room, love everything about it the colors are outstanding. 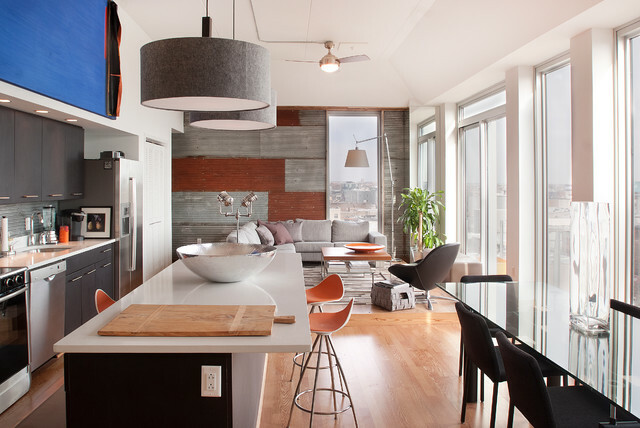 - Love the rug! Where is it from? - is this a custom unit or purchased out of a store? if so where and type of wood? Good day, I'm a designer, woodcarver, unique furniture maker. I make different furniture for orders, and can make similar or more interesting unit for order. Pelase, check my page here and contact me if interested. God bless! This is beautiful. Where is the bedside lamp from? The lamp is from ikea. I have one. - Where did you get the shelf on the left? It's awesome. Good mix of brown/blue btw. Hi, thanks for the question and compliment! The shelf is from Crate & Barrel. Very warm, cozy and beautiful. - Of shelf is that? It's from Crate and Barrel. Thanks for the question! - Hi, color on the back wall is really nice, do you have the number/ brand? Thanks for the question. 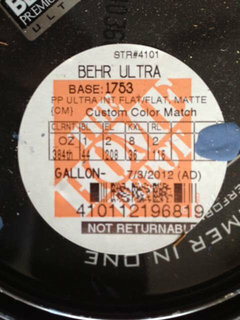 Attached is the exact details for the color, it is from Behr Ultra. It is actually a custom color match to a shade in the painting to the left. Is that a king size bed or or a queen turned? - Is that a king size bed or or a queen turned on its side? it looked very short. Thanks for the question! The bed is in fact king sized. 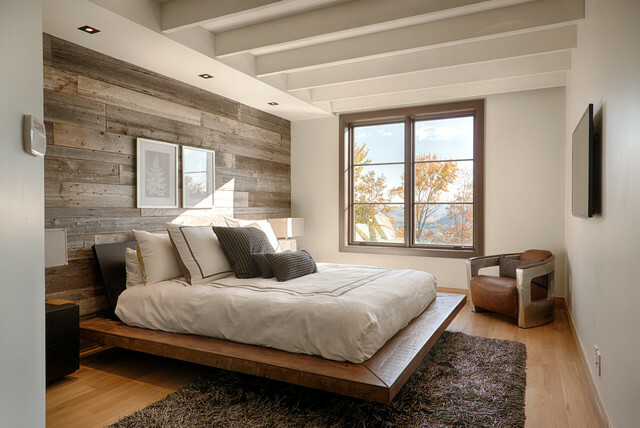 What is the name of the wood wall paneling and where do I purchase it? what is size of the window? - what is size of the window? - Love the color. Could you tell me the brand of paint and color name. 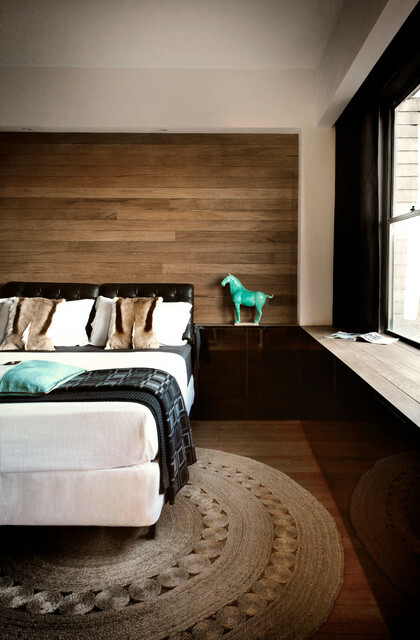 - what kind of wood for the headboard?? how high is the celingin this room? 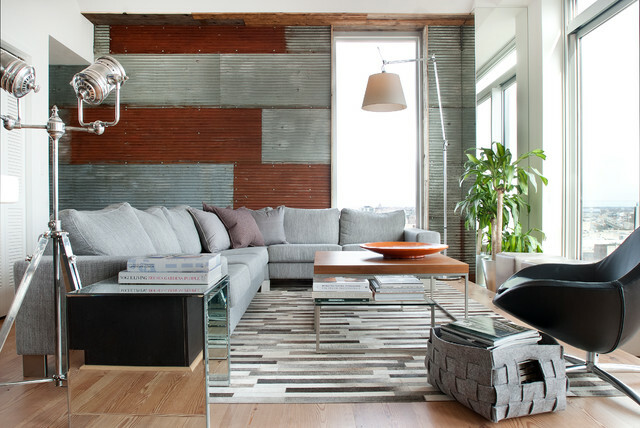 - The wood wall really creates and defines the space well. 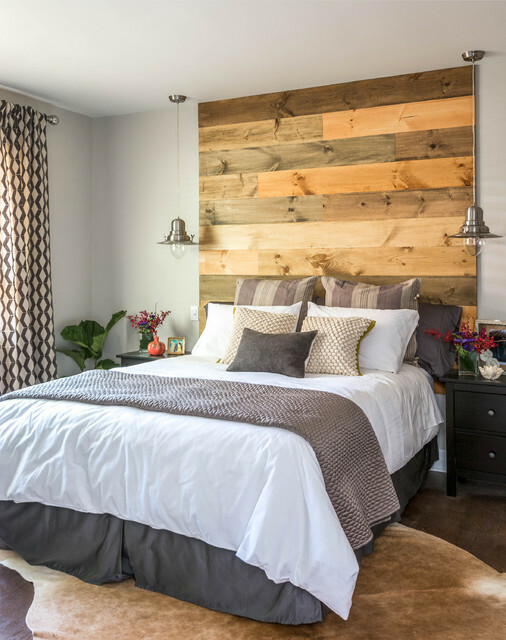 How did you attached the wood backdrop to the wall? Is it one piece? - Gorgeous Space! 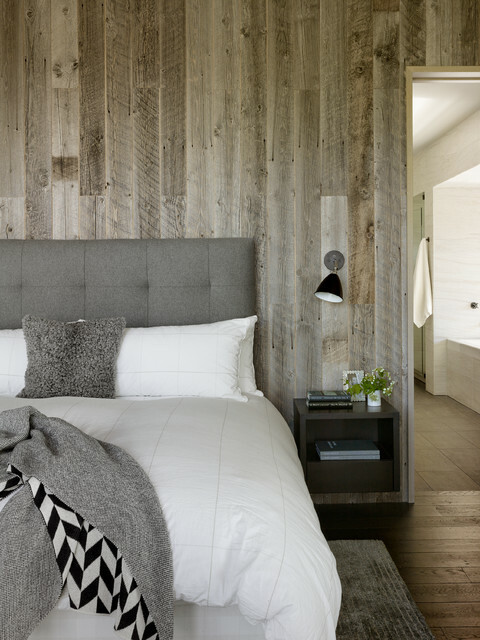 Where did you get the dark gray headboard from? 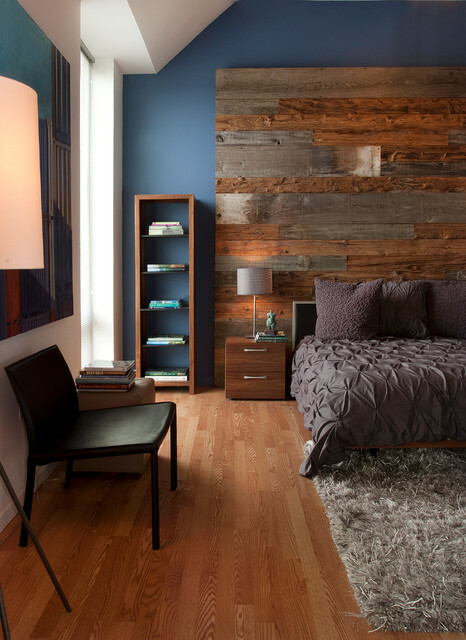 I have a reclaimed wood wall in my room and I think it would compliment it nicely. 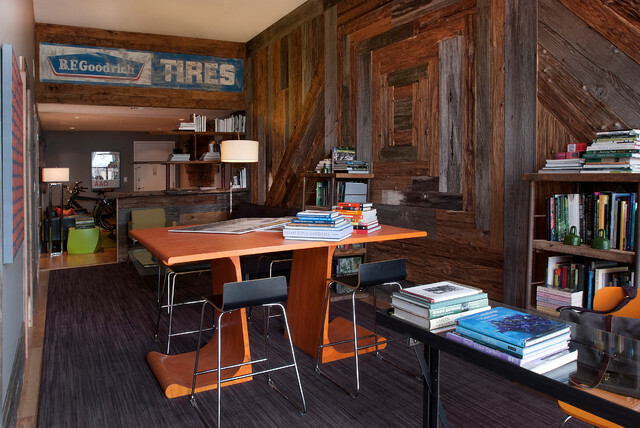 - I have a building question I love all the reclaimed wood in your place and have two questions. on the wall in the living room how was the wood applied to the wall. was it insulated. and the tin paneling again how was it insulated. I want to do some of these thing in a house redo. Love the back wood. Where can we get and how much does it cost? 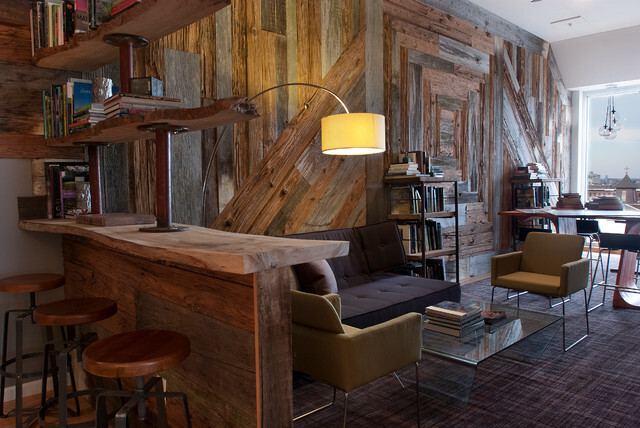 Does your company sell this reclaimed wood? I'd like to purchase. - And how would I attach to the wall? 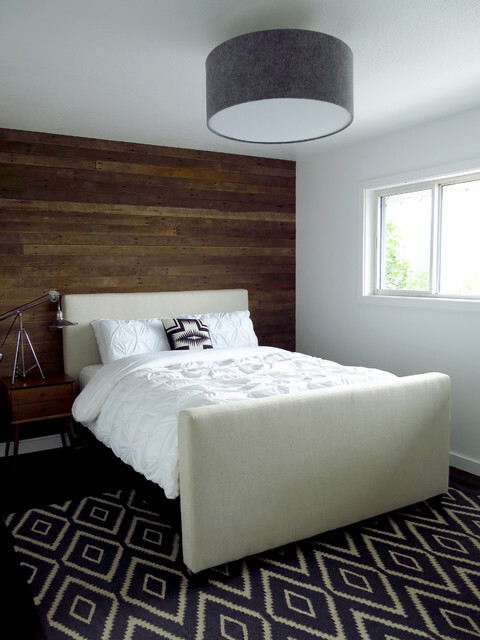 What are the dimensions for the wooden headboard? - Did you sand or stain the wood? - Is there a reason for using that much of wood in this design? What's the name of this rug at shaw floors?